Fontes & Phillips Wines is a boutique, family owned wine project. Owner and renowned winemaker, Alan Phillips works together with wife, Rochelle Fontes-Phillips, to create a portfolio of small-lot wines from world-class Santa Barbara County vineyards. Rochelle and Alan (Fontes & Phillips) have been involved in the wine industry for a combined 35 years. After graduating from UC Davis’ Enology Department in 1976, Alan began his winemaking career in Napa Valley. In his early years in Napa, Alan worked with winemaking legends like André Tchelistcheff (at S. Anderson), and following a couple years of experience helped the Corley family establish Monticello Cellars. Winemaker for Monticello for ten years Alan eventually left to do world-wide winemaking consulting. In the mid-1990s Alan moved to the Santa Cruz Mountains where he met Rochelle Fontes. In the wine industry herself, Rochelle has developed a career in winery compliance and accounting. In 1998, they moved to Santa Barbara when Alan was hired manage and develop Foley Estates and LinCourt Vineyards. 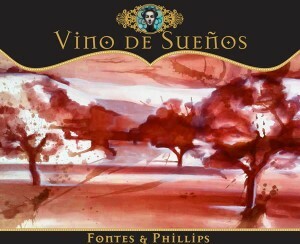 In 2008, Fontes & Phillips, the family project was created. Each wine is handcrafted and sourced from single vineyards of high acclaim. Even the bottling and packaging is lovingly done by hand. Each bottle is personally labeled by Alan and Rochelle with handmade pewter labels from South America.